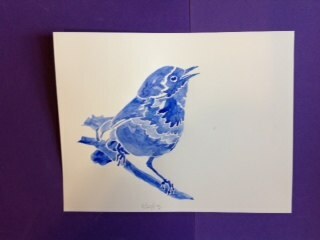 Warblers watercolor class lesson - 5/21/13. 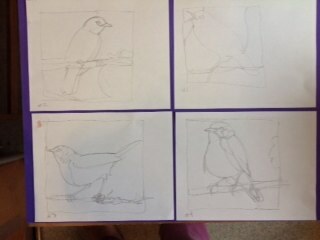 Continuous line drawings as warm-ups, and 'stencil' style direct painting. 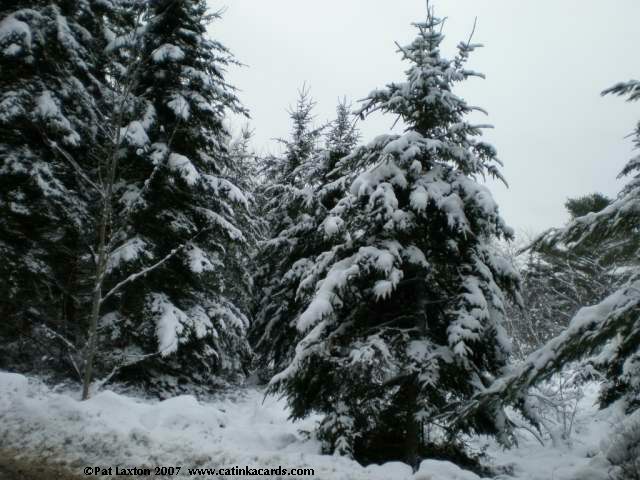 For Christmas and winter, snow is here. 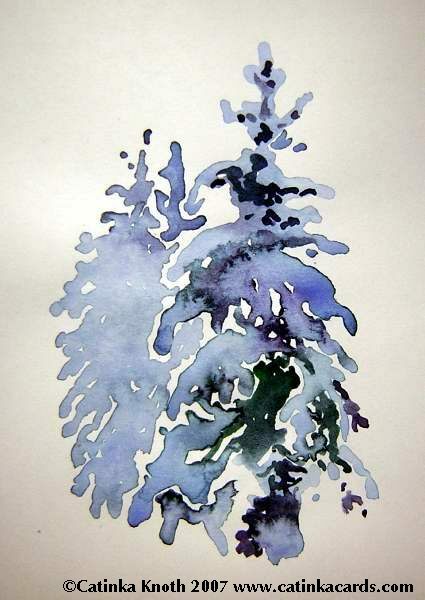 Try these watercolor and drawing exercises for painting evergreens in snow. 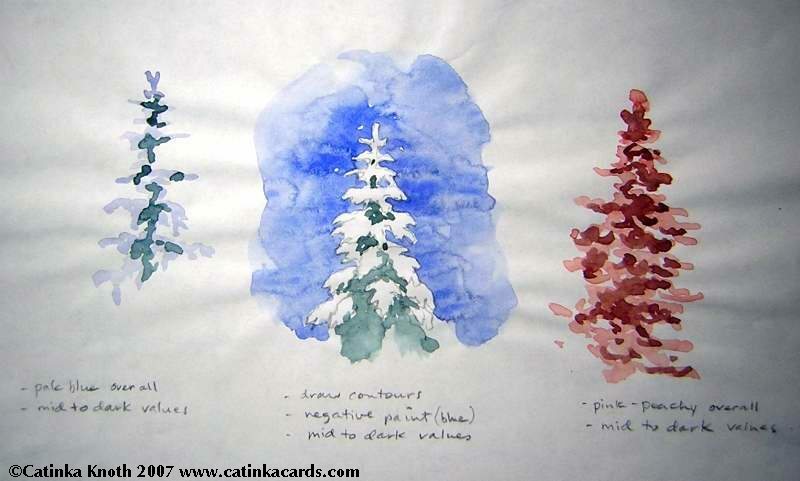 Print out the sampler and try these three ways to practice watercolors of winter evergreens. Contour drawing of tree, negative paint background, lay in dark undersides of branches. Pale peachy underwash for trees, lay in darker undersides of branches. Practice negative painting a background wash around the main form or subject. Make the wash move around the picture instead of horizontally or vertically. Let it swirl as the weather patterns you see moving over our planet from the satelite pictures. Pull the puddle of wash around. Let the paint/pigment swirl in the puddle. Be spare with your mixing. Let the water do the work. Have fun watching it come out. Watercolor Lessons List - at some point I'll fill in details on this rough list. These are most of the lessons I've taught since summer. St. Patrick's Day - Irish landscapes, greens? Does the Circus Still Come to Town in March? Last week in the watercolor class I teach we painted deer. Here is the lesson on drawing and painting deer. For reference material you can use photos of deer. A good source is the U.S. Fish and Wildlife Service's Digital Library System. We used silhouettes from a very old library book, and drawings from a favorite of mine, Ken Hultgren's The Art of Animal Drawing, a wonderful Dover Publication. At USWFS I found wonderful pen and ink drawings of deer, by Bob Hines. Have fun practicing. This watercolor of whitetail deer I started last year when we did this lesson. I did a few more touches on it this year. Just a note: I thought I had some entries under this topic and found that so far all the watercolor lessons are under the topic 'watercolor class'. 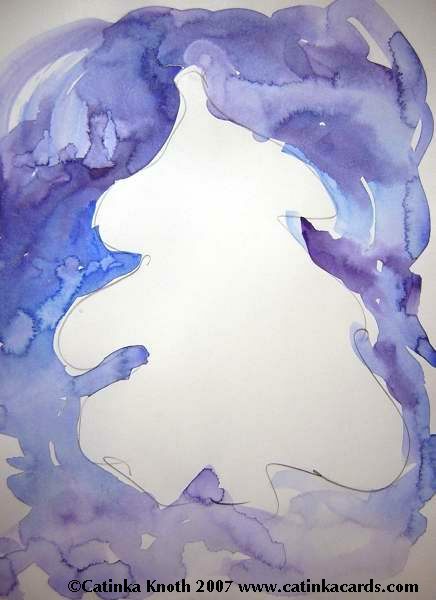 As soon as I put up a new lesson it will go under this topic list (watercolor lesson).